I recently finished an edifying book called "THE MEMOIR PROJECT" by Marion Roach, which in effect was a short course on how to properly write a memoir. I'm certainly not so long in the tooth as to be feeling the urgent need to write my memoirs just yet, but one of the many points of Roach's book was that you may as well get started right now - even if it's simply loose stories on a blog. Hey, I thought - I have a blog. Now I know that you readers don't come here for my misty water-colored memories, and that's fine - but the precedent has been set before on this blog, here, here, here, here and here - even if you didn't read them (you should read the China one, though - those are real photos that I took). I'm not ready to collect my life stories, such as they are, and foist them upon you - though let me say that Roach makes it clear that you don't need to have led an extraordinary life (whew! ), if you can tell a good tale and make it compellingly universal. I might be able to swing that. No, I won't get started now. I'll simply leave you with some things I found in boxes yesterday, first a mom/dad/Jay photo from 1969 (I was two), taken in Germany. They actually dressed me in a sailor suit. My parents were all of 25 and 24 years old respectively; I turned 38 the year my own son turned two, which is more the "new normal". 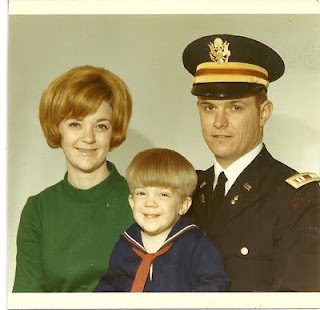 Which is kind of striking when you think about the gulf of self-wisdom and experience, to say nothing of back pain, that separates the ages of 24 and 38, and yet my parents did just fine. The other thing I found was this letter written by me to my great-grandmother Dale Houx in 1975. (Click to enlarge). There are a ton of these mementos in this box I just found (my grandmother saved everything, including these letters that she inherited when her mom passed away). As you can see at the bottom I had a self-imposed letter-writing schedule to keep. My son, now the same age I was when I wrote this, has never written a true letter, and quite possibly never will. This one caught my eye because of the veiled plea for a check that I never received (! 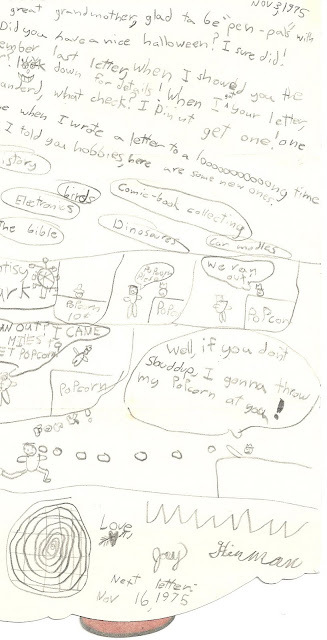 ); the preposterous cartoon; and my list of new hobbies, which somehow included The Bible (!!). I remember myself as having been a skeptic and then an atheist from an early age, but I also can remember this project I embarked on around this time to read the bible cover to cover. I got as far as Genesis, and don't think I ever picked the book up again. There's more where this came from, folks - but let me see if I can figure out how to present this in a more compelling manner before I foist too much more of it on you. I reckon you've probably got some detritus from your own past as well.